You've Got To Be Kidding Me?!!!! OMG....it's happening!! 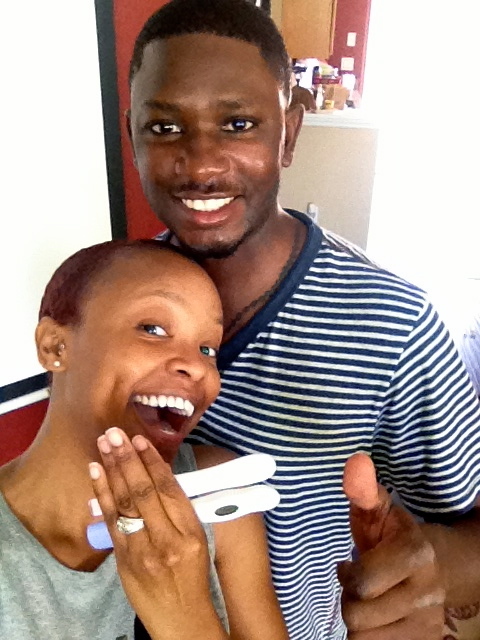 I am going bananas right now because......Tj and I are PREGNANT!!! Ahhaskdgosdnkbnsdhgasodgsdngh! Wow! Totally wasn't expecting this so soon. I stopped my birth control last month and although I was hoping that a baby would soon attach to my uterus, I expected I'd have to wait. I was told by my OBGYN that only 20% of couples get pregnant the 1st month after stopping birth control. That couldn't be me, as bad as I wanted this I never thought I'd be apart of that small percent. Thank God for this miracle because I think he knows how much of a nut case I would have been waiting month to month! Lord Jesus I am so GRATEFUL!!! He answered my exact prayer! I totally had a feeling. I took a test on June 2 that was negative but something told me to take another test before we left for Jamaica next week (I had planned on taking full advantage of our All Inclusive Resort with emphasis on the alcohol). So I did....this morning! (Yes I am writing this the day I found out, I had to type it or I'd scream it at the top of my lungs). I'd been having some symptoms, major attitude, some waves of nausea and frequent urination for the last couple of weeks. Although these symptoms were very apparent to me, I refused to believe I was pregnant. You don't understand, (though I'm sure you do) I have been wanting this for awhile but finally decided to "remove the goalie" last month. There was no way that it could happen this soon for me, so I thought! The first thing that ran through my head after seeing that 2nd line, "no effing way" "this can't be true" "I don't believe it". We smiled for a few minutes and then I decided to make the call to the OBGYN office and make the confirmation appointment. UGH...nothing available until we come back from vacation. Off to the drug store I go to get the EPT (error proof test) for 99% accuracy. I'm a nurse, I need the numbers. "Pregnant" it reads, ok so I believe it!!! Jamaican Me Crazy!!! 3 years of Wedded bliss!